The artist Tony Heaton poses in his wheelchair in front of the sculpture of a map of Great Britain made of wheelchair parts. The sculpture hangs on a wall behind him. 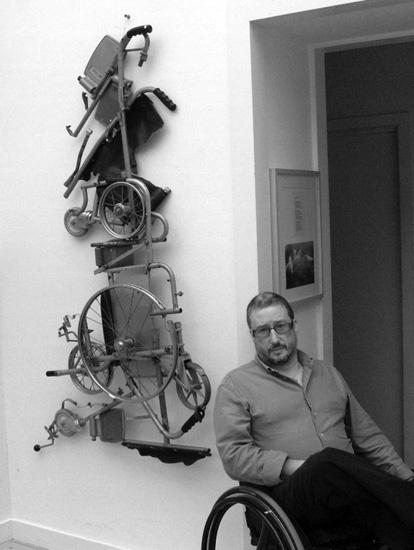 From 1989 to 1997, Heaton developed a leadership role in the arts and voluntary sectors in the North West whilst winning sculpture competitions and becoming a leading disabled artist/activist. As Development Officer for RADAR, then NACAB, he assimilated the skills and expertise of management, financial planning, partnership creation, human resources development and fundraising. During this period he led the transformation of North West Shape into Full Circle Arts, now one of England's most successful Disability Arts agencies. Heaton became a sculptor of organisations as well as of stone and wood; someone who relished challenge and change; someone who could be relied upon to get things done. A Guardian advertisement was to change his life: in 1997 he applied for and got his present post as Director of Holton Lee and moved from Cumbria to Dorset. Working with an excellent Board of Trustees he has transformed the environmental / holistic organisation by creating a visual arts / disability arts centre of excellence whilst concurrently expanding its original environmental and residential resources. Heaton sculpted a new architectural vision: a series of accessible buildings which would enable an artistic programme of work, a growth in residential capacity and most importantly a focus for disability arts. All would utilise local materials and would meld seamlessly with the natural beauty of Holton Lee's 350 acres of woodland, reed bed and heath land landscape adjacent to Poole Harbour and Lytchett Bay. Millions of pounds have been raised to build exhibition and conference facilities, artists studios, residential accommodation and most significantly the National Disability Arts Collection and Archive (NDACA). An architectural partnership forged with Tony Fretton resulted in Faith House at Holton Lee winning The Guardian Best Building of the Year Award in 2002. NDACA, scheduled for completion in 2008, will be a much needed institution for Disability Arts. Arts Council England has confirmeda grant of £350,000 and further grant decisions are pending from the Heritage Lottery Fund and trusts. The concept has been developed in close consultation with the disability arts community, involving three conferences since 2001 with a further conference planned for 2007 to agree acquisition polices and the infrastructure of the dispersed archive. NDACA's unique collection will hold important objects including paintings, sculpture, literature, poetry, film, dance, performance, drama and related ephemera which express disability, through Disability Arts, within a social and political context. Heaton says, “The role of DAFs will be crucial in establishing all aspects of NDACA's ongoing activities including training, artwork selection, operations, programming events, fundraising and liaison with Arts Council England”. Additionally, an MA degree in Disability Arts, available in 2008/09, is offered by the Arts Institute of Bournemouth in collaboration with Holton Lee and the two organisations will promote residencies, seminars, studio spaces and exhibitions. creative journey from footprints in the sand on the beach at Silverdale, Morecambe Bay via NDACA at Holton Lee to Square in the Circle at Portsmouth has been exciting and productive for Tony Heaton. He is a major figure in the Disability Arts movement.